There is no doubt that all the wedding dresses are bearing the meaning of purity, love and new beginnings. But some designs are bearing overdose of romance worthy of the pretty bride , who is loving simplicity and luxury together. These bride, and away from strong embroidery with crystals, sequins and sparkling stones. We chose a bouquet of wedding dresses of the global fashion house “Berta”, upscale fabrics of lace, and luxury perforated designs which help to highlight the beauty of textures and eye-catching elegance and smoothness. As they are also features of the lightweight which is embroidered smoothly even those of tiny crystals and pearls , to help the bride to walk freely and easy mobility lightly between her invitees and in the arms of her groom during the first dance and throughout the whole wedding evening. 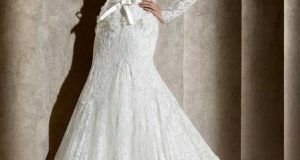 Join us to look at the latest collection of the lace wedding dresses, which are rich with embroideries fully studded dresses with glittering crystals and stones, and inspire the best one for your best look at your wedding day.